This halo ring exudes elegant brilliance with stunning vitality to make a bold statement. Made of rhodium plated fine 925 sterling silver. 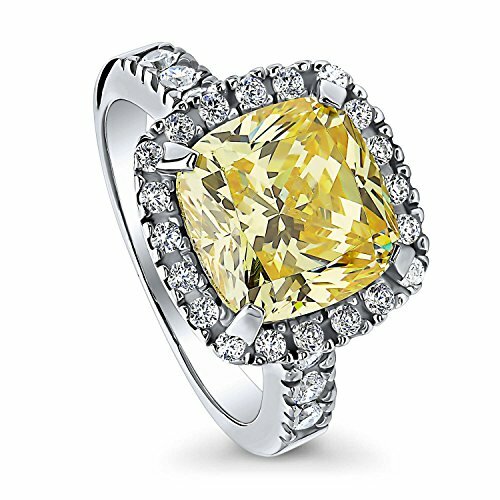 Features 5.62 carat cushion cut canary yellow cubic zirconia (10mm) in 4-prong setting. Accented with 0.5 ct.tw round cut clear cubic zirconia in prong setting. Band measures 2.5mm in width. Imported. DISCLAIMER: All cubic zirconia stone weights are approximate and listed as diamond equivalent weight in carats. Actual product colors may vary from colors shown on your monitors due to variations in calibration. Jewelry is not intended for children under 13 years of age. Photos may be enlarged to show details. All product measurements are approximate. METAL: rhodium plated silver, stamped 925, high polished finish, nickel free. RING BAND WIDTH: 2.5mm. STYLE: This halo ring exudes elegant brilliance with stunning vitality to make a bold statement. STYLE: Statement - Turn heads with this statement style. Engagement - Ideal for engagement, this ring will be perfect for your special one.